Rush is a band of perfectionists, their music is well crafted, constructed and performed. 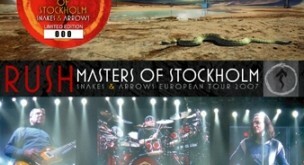 The individual members have been asked in many an interview as why they never released a box set of unreleased goodies. The answer is always the same, there are no leftovers, they work out a particular amount of music and form it like one would a sculpture. 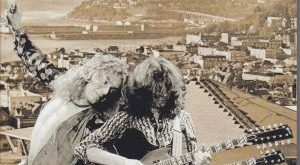 Their early work was raw and basic, semi progressive yet hard and metallic with Led Zeppelin and Cream being obvious influences. They took the long progressive pieces to the maximum with Hemispheres, owing much influence to the greats, Yes, King Crimson and Genesis. The decade of the 80’s found the band taking in new music inspiration, Reggae and New Wave being at the forefront of the trio’s ever expanding music tastes. This new music would not only inspire but challenge the group and their focus would be to not only master epic sounding music in five to six minutes, but to harness cutting edge technology. While you see many of their “periods” broken into fours, once you break it down they are really duos, Rush and Fly By Night, Caress and 2112, Kings and Hemispheres, etc. The mid to late 80’s would produce their most technically advanced music of their career, and based upon interviews with the band, for two of them, would be some of the most rewarding of the four decade long career. Let’s examine the sound, it is a soundboard of some kind, it is relatively lo-fi and flat sounding not having a lot of dynamics. It is very clear and very well balanced and does not sound bad loud, I also wonder about the generation, I do not believe the source was from the master tape but probably a couple off the master. It does sound like just a bit of noise reduction was used as well. The above assessment of having completely different arrangements is not exactly true, save for the Manhatten Project, the basics of the songs are here, the song structures and all there as are the lyrics. What it has is much more guitar and less layered keyboards, basically this is far they honed the music in their practice or rehearsal area prior to entering the studio. What is interesting is the track listing, I wonder if this tape was just to have the songs to listen to in their home and car and evaluate outside the studio and see how the flow of the record would work as well, quite interesting. Middletown Dreams: Intro is simplistic and keyboards are very basic, Alex’s guitar is rhythmic with textures that will be later made by the keys, there is a brief fade out at 2:07 missing the “Like a brilliant shooting star” and the outro is longer and more simplistic. Great drumming by Neil, Gedd’s vocal delivery sounds as if he is reading from a lyric page. The Big Money: The hit single. This is by far the song here that is the most close to the PW version, it’s obvious they really liked the song and it came together quickly. Mystic Rhythms: Shorter, not as upbeat and at times is really heavy sounding thanks to some Taurus pedals and not as, well mystic sounding as the PW version. Always love this song, this version makes you realize this song could have fit on any of the early 80’s songs. Marathon: This song suffers from the phasing giving it a bit of a warped sound, there are a few instances where the sound clears dramatically. This version, while being a bit more guitar heavy, does not lose any of its hard hitting energy, Alex has a great solo in this song and the middle section is really great with Alex getting into a heavy choppy riff. One of the better demos on this tape. Emotion Detector: This song is actually a bit more upbeat, Alex’s guitar gives it a slightly different sound as it does not quite mix well with the keyboard tone, but hell this is a demo. The ending is longer with Gedd singing the chorus a bit more. 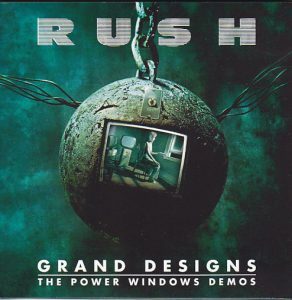 Grand Designs: None of the songs officially recorded energy is lost here, I really enjoy Alex and Geddy’s instrumental harmonizing on this song, his guitar playing and leads are the highlight of this song, it really has a “live” feel to it, stellar! Territories: This demo captures the feel of the PW version well, sounds more produced and Gedd’s vocals have been doubled, I wish the recording was a bit clearer, it could be Alex singing also. While lo-fi, this song has some punch to it. Obviously this was one sound like it had a lot of work done to it and it’s obvious they had ideas on how it would fade out, just not fully realized on this version. Manhattan Project: This is the one demo that has the most different arrangement, the tempo is completely different. Parts of the song like “big bang took and shook the world…took down the rising sun” sounds like the PW version while just before that has the band sounding like a Reggae band. Much of the components are there, just not as refined, you can tell they had to simplify the structure and guitar playing then embellish the rest. The most different version here, but the most interesting. Lots of cool bonus material, I am a bit surprised they did not include The Big Money or Middletown Dreams from the March 1985 “Second Tour of the Nadars” where they played the first pre PW live versions of the tracks. 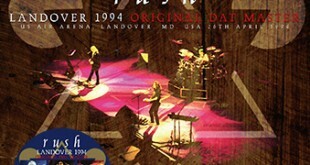 First bonus track is Freewill from the 1979 “Tour of the Semispheres”, the full audience recording for the Allentown show was released as Two Great Suites (Gypsy Eye 113), the song is fully formed, all except Alex’s guitar solo, he jumps right into it but it is not the signature one he would later play that is one of his best. The sound is louder and clearer than the old Gypsy Eye title but does not have as good bottom end. The next two songs are from just over a year later at the same venue in Allentown, PA on September 30, 1980, Limelight and Tom Sawyer are taken from the “Pre Moving Pictures Tour”. This material has been again released prior on the title Hyperspace (Gypsy Eye 170) and is a soundboard source. When compared to the Gypsy Eye title it is simply better, louder, clearer and has better dynamics, great versions of these songs. Subdivisions comes from the Hartford Civic Center, December 20, 1981 on the “Exit…Stage Left Tour” and is a very good soundboard source. 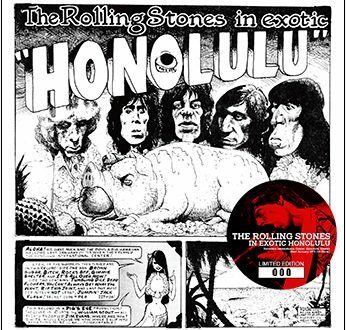 The full recording was released a long time ago as Moving Pictures Story (Gypsy Eye 056/57). This version is a little upgrade over that title, little clearer and with more of a punch. Really cool to hear Alex singing his “Subdivisions” line, the song is more guitar heavy than what would come on Signals. The last two songs are culled from the band’s September 1983 multi night stand at Radio City Music Hall. 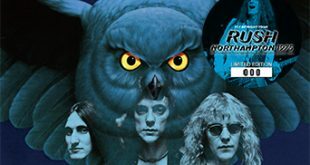 The audience source is very good and taken from the first of five sold out dates at the famous Manhattan Hall, Geddy introduces it as “something that will probably be on the next album”. Like the other pre LP live versions of this title, the song is virtually 95% complete. The Body Electric is excellent Geddy’s bass is strong in this recording giving it a real kick and Alex’s solo is very interesting and hard to describe in words. This recording is from a short span of dates referred to as Pre-GUP, if you like what you hear track down the free torrent called Countdown – Platinum Edition (Digital Reproductions DR 91883). The packaging is what we have come to love from the Peach folks, mini LP sleeve, the cover art work is based upon fan art, the band photos on the back are slightly different. The CD sleeve has track listing as well as an advertisement featuring the “kid” and binoculars. There is an insert with liner notes as well as PW era live shots. I have had this material in my collection, it is nice to have on a real CD and the bonus tracks are a great inclusion. I must admit I was not expecting a Rush release from the Peach label, but I am pleasantly surprised as I know what I can expect from this label, I hope this leads to more Rush titles.